Running, spinning, yoga and Pilates might all get the glamor and attention when it comes to stripping fat, toning up and getting healthy. However, the humble and simple workout of walking isn’t too shabby either. Though walking may not get any of the glory, it sure punches above it’s weight. Research suggests that weekly walking distance is closely linked to longevity so walk long and live long! Walking for an hour a day can reduce the risk of diabetes, heart disease, blood pressure, stroke, breast cancer, colon cancer, dementia, and even death. Walking can also help to alleviate symptoms of depression, help you sleep better and improve cognitive function. Many other cardiovascular activities boast these health benefits, but the great thing about walking is that you already know how to do it, you need virtually no equipment (bar shoes and clothing), you can do it at any age, it’s super easy on the joints and body, and the risk of injury is incredibly low. Indeed a study has suggested that walking is just as good as running at reducing the risk of health issues such as diabetes, high blood pressure, high cholesterol and heart disease! The point is, don’t think of walking as running’s dowdy cousin. Walking is awesome. Walking was something we used to do to get from A to B. Of late the distance between A and B has become rather short. As our walking levels have decreased, obesity levels have increased. Here’s how to increase that distance again, and do it in a way that you’ll lose weight, get stronger, more fit and improve your health. Walking is a gentle exercise that is natural and safe but if you have been sedentary lately, are significantly overweight, suffer from any medical conditions or are otherwise unsure, please visit your physician and get a checkup before you start exercising. The right gear. Once you have been given the ok, make sure the shoes you intend to wear walking are supportive, with good arch support, cushioned and comfortable. Your socks should be free of seams and holes, and the clothes you intend to wear should be cool and comfortable. Warm-up. Start by walking slowly for 5 -10 minutes. This will warm up your muscles and prepare your body for exercise. Cool-down. Don’t stop exercising abruptly. At the end of your walk, slow down for 5 – 10 minutes. This will allow your muscles to cool down. Stretch. After your cool down, gently stretch your muscles. It’s all too easy to let your enthusiasm run away from you and walk too far, too soon. This can leave you sore, tired and disillusioned; none of which will help you develop a long term walking habit. Instead, keep your walk short and then call it a day. If everything went well, add another minute or two to your next walk. Again, if you are feeling fine, add a couple more minutes to your next walk. Continue adding a minute or two to your walks until you can comfortably walk for 30 – 60 minutes. How Fast to Walk for Weight Loss? To lose weight walking, aim for 30 – 60 minutes at a brisk pace, or if you’re very fit a power-walk pace. Walking briskly isn’t just about weight loss. You need to walk at a pace of at least that of a brisk walk to reap the many health benefits of walking. For longer walks (e.g. 90 to 120 minutes), walk up to 60 minutes at a brisk pace, then slow down a little to complete the rest of your walk at a comfortable pace. So, how fast are a stroll, brisk walk and power walk? Stroll. This is a window-shopping type pace. On the RPE scale it’s an intensity of about 4 out of 10. Brisk walk. This is walking at a pace of about 3.5 to 4 mph. It’s a pace you might walk at when you’re walking fast because you’re running late for an appointment. On the RPE scale this is an intensity of 5 – 6 on a scale of 10. Heart rate target is about 60-70% of your maximum heart rate. You can carry on a conversation, but will need to catch your breath every few sentences. Power walk. Here you’re walking at a pace of about 4 – 5mph. You’re seriously torching fat at this level. On the RPE scale it about a 7 or 8 on a scale of 10. You can still talk, but only is short spurts of three or four words. Below is a rough guide of how many calories you’ll burn when walking at different speeds. How Long Should You Walk Each Day? Aim to walk continuously for 30 – 60 minutes most days of the week to lose weight walking. If you walk at a brisk pace for 30 minutes, you’ll cover a distance of about 1½ to 2 miles (2.5 to 3.3 kilometers). Take the distance into consideration when planning your walking route. On you non-walking days do other activities, such as strength training or Pilates. However, if you feel worn out, take a day off to recuperate and resume your walking schedule the next day. Walk more often – if you normally walk three times a week, add an extra walk to make it four. A few weeks later, add another walk to make it five. Try and work up to seven walks per week. You can also walk more than once per day. Seek out hills and rough terrain – walking on flat, paved paths is fine but getting off road or heading up hill will make your workouts more demanding. More demand means more calories expended and will increase the fat burning potential of your workouts. Set some goals – whether you are a walking newbie or a professional perambulator, goals can help you push your walking up a level. If you are currently walking 30-minutes per day, make it your goal to build up to walking for an hour in six-week’s time. If the furthest you have ever walked is four-miles, why not challenge yourself to walk ten-miles in three-month’s time? Goals can help keep you motivated. Whether you are walking for fitness or fat loss, your diet should match your exercise goals. You don’t have to follow some crazy fad diet to lose weight and get fit – just make sure you eat an abundance of good old fashioned natural food. Eat plenty of vegetables, whole grains, lean protein, healthy oils, nuts and seeds and some fruit and try to consume these foods in their most natural state. No need to count calories, just eat a healthy, low sugar diet that contains as few processed foods as possible and, when combined with your regular walks, you should lose weight gradually and easily. One of the best ways to “get into” walking is to make it a habit from the get go. Habits can take a while to develop and this challenge has worked for many people. Simply walk for 30-minutes every day for 30-days straight. For this “30 minutes for 30 days” challenge don’t do any other exercise other than a some stretching to keep your muscles supple. It doesn’t matter if you walk the whole 30-minutes in a single walk or do three 10-minute walks spread throughout the day – just get it done. 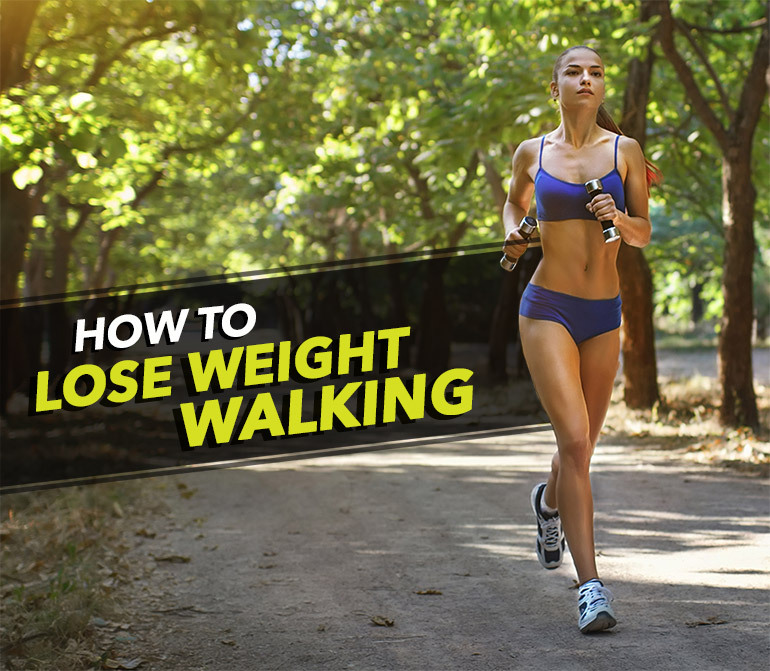 By walking every day, you give your fitness and weight loss a great kick start and by the end of the month you will have made daily walking a habit. What should you do at the end of the month? Keep going! Do another 30-days/30-minutes or up the ante and do 35-days/35-minutes. After that, why not 4-days/40-minutes? Whatever you do, just keep going!